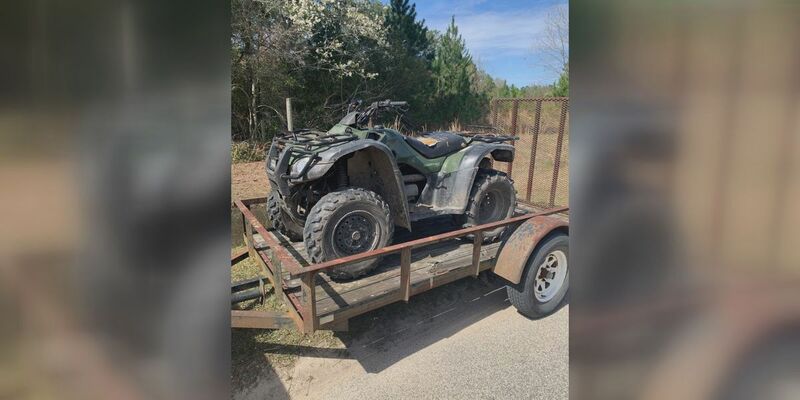 PIERCE COUNTY, GA (WTOC) - Pierce County’s Aggressive Crime Enforcement (ACE) unit reached out to Bacon County sheriff’s office and Alma PD to assist in catching two burglary suspects on Monday after an ATV, a lawn mower, and 14 firearms were stolen. The ACE unit and assisting agencies were able to identify two suspects involved; Cecil Dustin Hannah, 32, and Johnny Allen Thrift, 41. Hannah was located near the Bacon county line with help from multiple police and sheriff departments. Upon his discovery, Hannah fled into a wooded area. Canine units from Coffee County and Ware County tracked him down and Hannah was placed under arrest. Police were able to locate several items that had been stolen in Bacon and Pierce counties. The ATF is now taking over the case. Hannah has been arrested and charged with several charges including Burglary, Possession of a Firearm by a Convicted Felon, Aggravated Assault, Possession of Controlled Substance, and Theft by Receiving Stolen Property. Thrift is still at large and wanted by the Pierce County A.C.E. Unit. If anyone has any information on the location of Thrift, contact your local Law Enforcement Agency.